Within the niche world of LED smart lighting, there seems to be a burgeoning demand for lights as decorations. 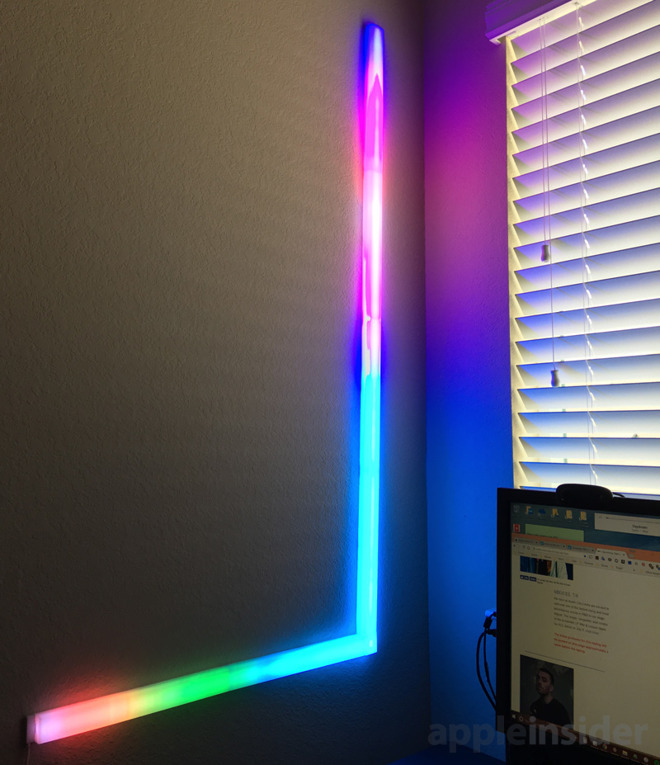 Companies like Philips and LIFX have lightstrips, LIFX specifically has the Tile, and Nanoleaf has its Light Panels. After all, why stick to bulbs when you're not bound by the limitations of incandescents or fluorescents? The LIFX Beam seems like an obvious addition in some respects, but oddly enough, the concept doesn't seem to have been done before. Think of it as a rigid lightstrip, only one that's meant to be conspicuously placed rather than line a desk or entertainment center. You can still do that, naturally. Despite the singular in its name, the Beam kit actually includes six beams, as well as a corner piece, power adapter, and controller unit. The beams and corner join together magnetically, and can be arranged in different patterns — typically in L-shapes or a straight line, since LIFX only includes one corner. Installation may be the trickiest part of the whole endeavor. Beam ends can only join opposite magnetic poles, and each segment sticks to the wall with special 3M adhesive, meaning you'll have to press against them to make sure they stick firm and flat. You can pull them off and reapply, if need be — and you probably will at one point, whether to pick another pattern, level the lights, or make sure that the power adapter (which is also magnetic) can connect to the beam closest to your wall socket. It's also vital to make sure the connectors on each beam are in full contact. As we discovered, if one of them is even slightly loose, it can prevent others from lighting up. In the case of HomeKit, it can cause a "no response" error in the iOS Home app. This probably could've been solved if LIFX had used a snap-together design instead of magnets. Assuming all goes well though, the LIFX app does a good job of onboarding, guiding users through adding the Beam to the LIFX cloud as well as HomeKit. If you want to go a step further you can add it to Amazon Alexa, Google Assistant, and even Microsoft Cortana, as well as platforms like IFTTT and Nest. We were able to test the product with HomeKit/Siri and Alexa. Both share largely the same set of voice commands, allowing you to change color and brightness, and turn the light on and off. The accessory can also be integrated into scenes and automations, for example automatically turning on at night. You truly can't get the most out of it though without its proprietary app. 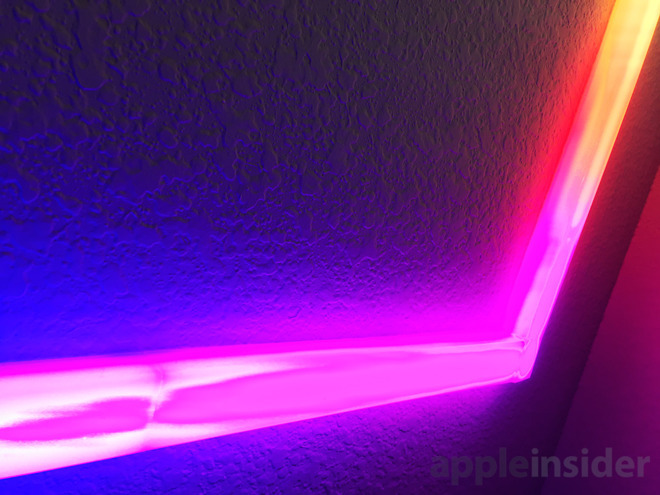 Siri, Alexa, and the iOS Home app can only set one uniform color, whereas the LIFX app can take advantage of the 10 separate lighting zones on each beam. 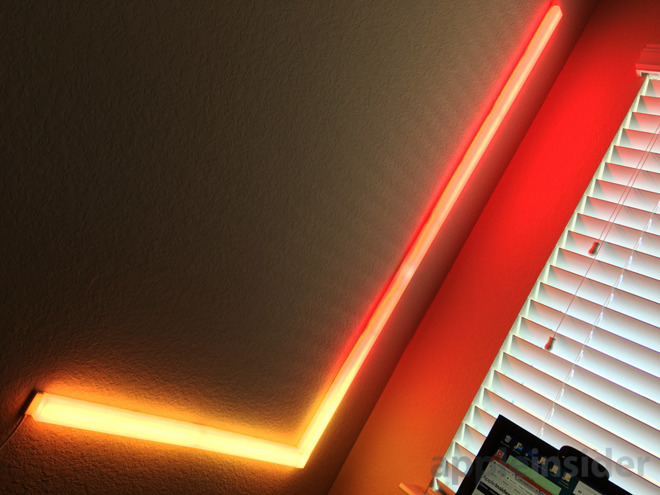 With six beams and an illuminated corner, you could theoretically have up to 61 different colors on your wall. 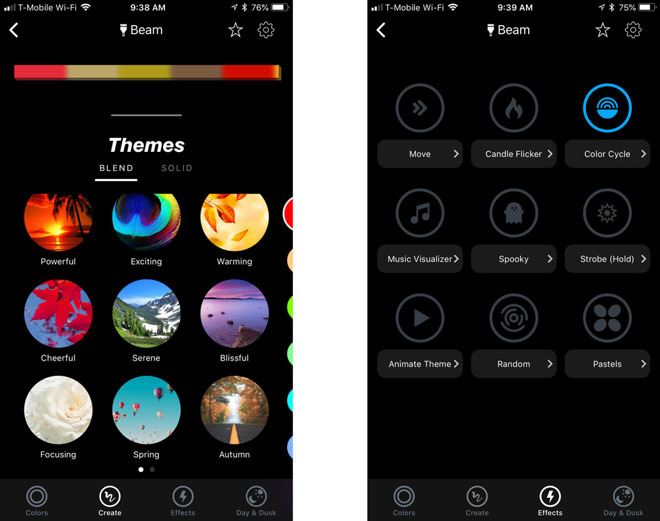 The app includes 18 preset themes, which can be applied to the Beam specifically or to a group of LIFX lights. You can further choose whether to make color transitions solid or blended. If none of these fit your mood, you can choose to "paint" your own theme. This generally works well, but you can't save your creations, and since the app can't tell what shape you've made with the Beam it's hard to gauge where colors will appear. Neat but of mixed quality are 9 separate "effects," which (usually) override any theme you have enabled. We found "Color Cycle," "Animate Theme," and "Move" visually appealing — the rest are disposable, such as "Music Visualizer," which depends on your device's microphone and didn't match the songs we were playing all that well. All that being said, how well does the Beam actually light a room? Reasonably. It's surprisingly bright at full intensity, but unless you're right next to it or in a small office, you'll probably want an extra lamp or two if you intend to read anything. By now, you've probably already decided on whether you want a Beam based purely on photos. Rest assured that yes, in person, the product does make a room look like something out of "Blade Runner" or other '80s cyberpunk fantasies. It's ideal for movie and gaming spaces for that reason. If you're going to get one, just be aware that it's not meant to be a practical product. It can only ever illuminate a small space, making it a decoration first and foremost. If you enjoy its looks and have the budget needed to get one, otherwise, none of its quirks should be enough to stop you. The LIFX Beam retails for $199.99 and is available at Amazon.com with free shipping.